also... since i have carbs off and the whole interior is exposed, it looks like hella.. all hoses covered in dirt crap.. oil/coolant all over... PO never took care of bike what so ever.. also it is from the uk because it is in km and it also have the firestorm logos on it... so can anyone tell me what exactly or how to clean?? block carbs off? spray with engine degrease? or what? also... I want to paint my bike 1 day.. I would like to do the frame matte black... as i've seen in pictures somewhere... how much harder/more time would it be to get that done?? do I need to take the whole frame off to paint it? or do I cover up stuff?? or how much harder is it to do that, while i got carbs and tank and everything else off?? i am heading to walmart now.. to get engine degrease cuz I know i need that much... but what else do I need?? can i clean all the hoses and plastics and everything with degrease?? I appreciate the help fellas.. stuck on the tps and the cleaning/painting question at the moment ..
for the tps,take out both the metal sleeves and widen the holes some so the tps can turn further each way,just like in the pic. or more water than degreaser like 60/40,after you clean it,than just wsh it off with good car soap and water to get the residue off. for painting the frame,best way is to take the frame off the bike.could either get it powder coated any color you want or take it to a good painter to get it sprayed the color you want,unless you know how to do it yourself. Last edited by saige; 07-26-2012 at 11:02 PM. for the tps,take out both the metal sleeves and widen the holes some so the tps can tur further each way,just like in the pic. Thank for the awesome quick response brotha!!! ..okay I will get that now...and I'm still kind of confused on the tps? Do I drill the holes out with the 3/16 bit like hawks tps thread?? What does the bigger holes do? ?i went and got 2 8mm torque screws...so what am I suppose to do exactly after I drill the holes out? ?im sorry but I'm just not getting this part ..it's making me sad lol...I got the 2 slide holes filled, 1 on each slide..the new keihlin jets put in at 2 1/4 front and 2 1/2 rear...am I suppose to be screwing with the nut on the other side? ?can you please explain each step and what piece is suppose to be adjusted...I'm sorry bro I'm just not getting this part..thanks a lot saige I really appreciate the help! Also...how exactly do I Mia the degreaser 50/50 if they are in spray cans? ?what do I do exactly spray it in a bucket and mix water? ?or do I spray on and use water to clean? ?im at Walmart now so if anyone knows this question please answer it is much appreciated. no,dont drill them out,the little metal sleeves will pop right out with a little push. you are just gonna use the drill bit to widen the oval hole some.once that is done,put the sleeves back in the hole,it might not be snug in there,but thats ok,its just there so you dont crush the plastic when you tighten it down. this will allow you to turn the tps just a bit more once you screw it in.do you have a meter to read the ohms on the tps. 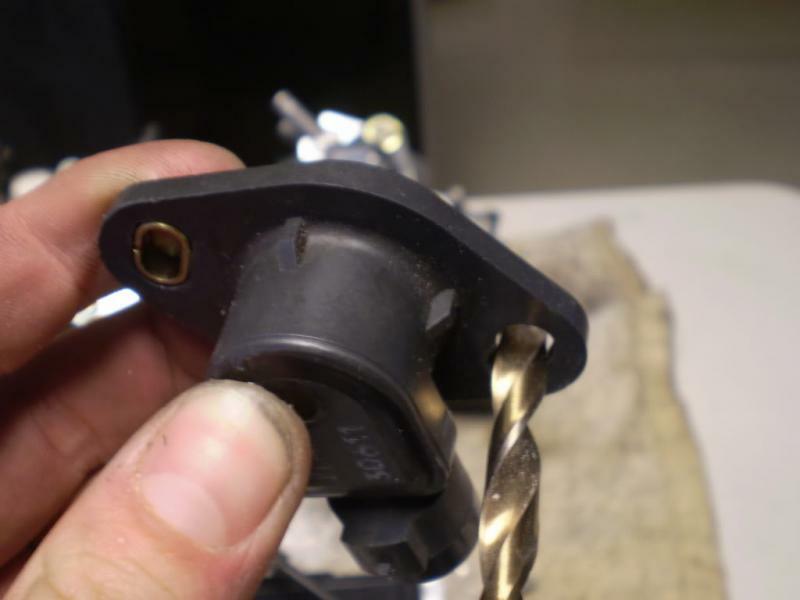 for the carbs,if im not mistaken,it is only the front carb slide you are suppose to fill in.i may be wrong,so hopefully someone who knows will chime in,or you might have to read the carb setup again to make sure. what is the thickness in total of the washers you are using for the needles. the keihlin jets,as far as i know,they just go in where they are suppose too. the 2 1/4 and 2 1/2 turns is for the air mixture screws only. in the pic,you will see the location of the air mixture screw,yours might look like that since you got the firestorm,not sure,but that one in the pic has the fitting for a flat head,the U.S. version is a D-shaped kind of bolt. Last edited by saige; 07-26-2012 at 11:33 PM. powder coat is a very strong kind of paint,it is sprayed on,and than put in a oven to bake. can google it,so you can see the process. if you want it mat black,than if you want it too look factory and really nice,i would take the frame off and get it done. you can buy degreaser that is concentrated,the purple or green stuff.with a strong water hose,can just spray off,or could use preassure washer,but at a distance and very carefully,could do damage. if you buying the stuff in can,be very carfull with where and how you put the stuff on the motor and bike. 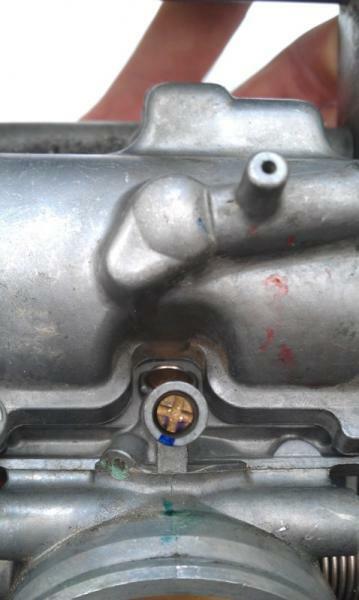 take all plastic body parts off,seal up any holes that is open to the motor,dont let nothing get in where the carbs sit. do not get any on chain,bearings of any kind,becarefull period where it goes. wash afterwards with soap and water,maybe even twice. Wow thanks do much man!! !on the slides, it's 1 on each hole...I thought so also but he explains a situation only doing front, then at end of paragraph says that's why you do 1 on each slide...and wow!!! I did the turns on jets! !o was wondering why they were lose! !thank god u said something bro u would have been screwed ))...I just bought degrease for oil and heavy stains, and 1 for the hoses and plastics and stuff ...okay I will be home in ten minutes and ill see ur response...I do not want the factory black..I want all the silver to be a matte black color...I'll try and look up powder coating but what is the difference?? And on the tps...I think I understand..so take out the metal, and drill a slighty bigger hole to allow the tps to move a bit?? ?is that what I'm trying to do? ?and is it clockwise or course clockwise? ?qnd do I do both holes?? ?sorry I don't know why I'm not understanding this tps thing lol!!! !ur awesome saige..cheers mate! with the powder coat,it can take hits from small debris that kicks up in traffic and not chip of flake,it can take a beating. '"and drill a slighty bigger hole to allow the tps to move a bit?? ?is that what I'm trying to do? ?and is it clockwise or course clockwise? ?qnd do I do both holes???" yes,both the holes you want slightly bigger to be able to turn it either which way.im not sure which way it needs to turn,but as long as you have the meter hooked up to it,you will see the numbers go up or down,you will figure out which way to turn once you see the numbers going where you want it. Okay awesome..I'm eating upstairs I'll be down in 5 minutes to try ..thx a lot buddy! !am I suppose to put that metal piece back in? ?or is that what the washer is for? ?i went to radio shack and bought a pack of small washers x20 #2,#4, #6, #8, #10...why do u ask which washer bro? by metal piece,do you mean the oval sleeves you will take out from the tps,if thats what you mean,than yes,it will go back in the hole.it is so you dont crush the plastic housing.it will need to be very well screwed in to stay in place,dont do a hulk move on it,but good and ssolid. was asking about washers because wasnt sure if you had the correct thickness for each slide or not,but from the sound of it,looks like you got that covered. ok,good luck,its late for me where im at,so i will check back in later in the morning. update .. 1 of my slides is not 100%.. i spent an hr trying to get the slide back in.. and was like wth I couldn't get the gasket on.. then i tried the other 1.. bam easy as hell... so i went back to the other 1(after already putting it on wrong) and realized there was indents all over the slide gasket... so it wasn't 100% around so it couldn't go on straight... now i have to look for a slide.. does anyone know where I can find 1 cheap?? also secondly.. how hard is it to take the frame off from having the carbs off already?? I would like to get it painted matte black... how much would it cost for me to paint it myself?? saige mentioned something about powder coat.. is that the tough looking paint?? like rough?? i would like to paint all the silver frame and sub frame from silver to matte black.. any help or leads would be awesome!!! edit: groves are okay, I just wasn't doing it right.. yay to forum search, good day! Last edited by Shane702; 07-27-2012 at 05:32 AM. Powder coat can be rough, it can be smooth, and it can be any color you want. It is a lot like a glaze that goes on pottery, you put it on in a wet state, then bake it and it hardens and takes on its color. If you want the frame black, powder coat is the way to go, but dont expect it to be cheap. It will be around $200 for the frame, up to $400 for frame, swing arm, and sub frame. To remove the frame, are you prepared to disassemble the entire bike? You will need to strip it down to ONLY the frame, which means the front end, engine, swing arm, shock, subframe, did I say engine?, and all electronics need to come off. Wherever you take it to have it powdercoated will have to media blast it, spray the coat, then put it in a kiln, so there can not be anything on the frame whatsoever. If you want to just paint it, you need to know the proper procedure for painting, then you need to get the materials to paint aluminum, which is not cheap. Then you need a paint booth and a sprayer. You could use rattle cans, but dont expect it to last long or look very good. Do you have Dr Honda stacks? They are an aftermarket part, stock is two plastick ones with the rear being longer. An alternative for the frame could be a product called plastidip. It is a spray on coating that dries to a rubber like state. You can buy it in gallon or rattle can, and if you don't like it or want to do another color it peels right off with no residue. The best part is that the only prep work is cleaning. It can be glossy or flat, lasts up to two years, and can be removed like it was never there. If you are set on having the frame black, that is your best alternative to having it professionally done. Just remove the big body parts and tape off anything you don't want sprayed. No sir everything is stock on bike mostly...so that means only close the front slide not the rear right? If you do a one shot process where I'm at you might be able to get the frame done for $100. I've heard you want to be careful with plastadip in areas of high heat. I think someone had it on their swingarm and the exhaust heat peeled it off. Powdercoat is actually a type of plastic that is baked on, very, VERY durable compared to paint. Shane... clicky on my picture in my signature to see a lot of the process of what you're asking. I had to disassemble my bike, and taking the frame off is not a simple process (it's kinda wordy, so you may want to just look at the pics, haha!). Like Tweety said, it takes a couple special tools to do (although you can make these). Cleaning the frame, I use a product called "Simple Green". What also works WD-40. A nylon brush, some rags, some robust finger tips and a lot of patience help. And yes to your answer of only closing the front slide. Only do both if you have aftermarket stacks in there. It'll take a long time to do the frame if it's your first time through, depending on how much free time you have and how quickly you can access/gather tools. You have to take the forks and wheels off (and if you're doing this, it's a good idea to replace the steering bearings and wheel bearings like you were mentioning). I don't mean this in a bad way, but you could break something along the way, or find something broken. If you're like me-and you seem to show symptoms-you probably will want to clean everything as you're putting it back together. Especially if you have a nice new powdercoated frame, it's hard to put dirty old parts back on! If you're doing a simple motor swap like smokinjoe just did a couple of months ago, you can do it in a weekend, but stripping the frame is more involved, and IMO would be be best use of your time if you planned on more upgrades as you go. So I'd say that you have a couple of options... go with the frame that you have and use your bike for riding, or strip it down and bond with it and use it as a learning tool and ride in a few months. Depending on your garage situation and if you live up north, maybe do it as a winter project? I've heard of people polishing aluminum with steel or brass wool, then applying a wax to keep grime and prints off. You could look into that as something to do with the frame still on...? Oh, and I'd re-drill that hole in the slide. Changing needles to fix that will just cause problems elsewhere! im in las vegas... I can work any day any night round the year.. =].. may get a little hot out, but garages are nice yes.if 3rd world countries can do it, I can do it mate .. anyways im just now getting to ur pictures.. been a long day... gonna check out everything u wrote... i am very interested in doing the matte black replacing silver... is satin black really the closest they come?? i sware i've seen matte black on bikes... even the cbr when they had the new tail had black on matte black didn't they?? thats what i really want.. black on black with red =].. it should be possible.. i mean anything is possible, right? reminder: anyone with appliance or electrical problems, I made a thread to ask me questions if you guys run into anything!